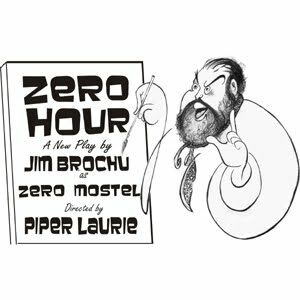 ZERO HOUR, the one-man show from Jim Brochu, is playing a limited engagement in New York City. The show is at the St. Clement's Theatre now through Jan. 31, 2010. ZERO HOUR features Brochu as Zero Mostel. The play is directed by Piper Laurie, and is produced by Kurt Peterson and Edmund Gaynes in association with The Peccadillo Theater Company. Set in theatre legend Zero Mostel's painting studio on West 28th Street, a naïve reporter attempts to interview the famously volatile artist, prompting an explosion of memory, humor, outrage and juicy backstage lore. Mostel is remembered for his comedic genius and his definitive roles, but in the 1950's he was equally known for his place on the infamous Hollywood blacklist. Directed by three time Oscar nominee Piper Laurie (The Hustler, Carrie), Jim Brochu's striking portrayal brings all of Mostel's swagger, ferocity, intelligence and fantastic wit back to the stage in this mesmerizing and hilarious tour-de-force. Since its Ovation Award-winning debut in 2006 Zero Hour has played to sold out houses all over the country and was named one of the ten best plays of the Los Angeles Theatre Season (2007) as well as one of the ten best of the South Florida Theatre Season (2008). Jim Brochu won the 2009 South Florida Carbonell Award as Best Actor in a Play for his performace as Zero Mostel. St. Clement's Theatre is located at 423 West 46th Street, New York City. Tickets will be available by phone at (212) 239-6200/800-432-7250 outside NYC, or online through Telecharge.com. For more information, visit www.zerohourshow.com. Here's a video clip of the opening minutes of the show, filmed at the Stage Door Theatre in Coral Springs, Florida.